What does it mean if someone says "I'm in danger of breaking sweat at any second." ? And what is sodding fertilizer? 1) The phrase is usually "break a sweat" and simply means to start sweating. I used to hear this a lot in the days when I regularly attended a gym. Some of us would be in the gym, very hot and sweating a lot, but there would be other people there who appeared to be working just as hard but somehow stayed completely sweat-free! We would say "It's not fair. Look at her. She's been on the treadmill for 30 minutes yet she hasn't broken a sweat!" 2) Sodding fertilizer?!! I have no idea if this is a technical term. Fertilizer (fertiliser in BrE) is the substance which is put on the ground or on plants to "feed" them. A "sod" is a lump of soil. I haven't heard these two words together unless you count the fact that "sodding" is a BrE swear word, in which case the speaker was for some reason annoyed about some fertiliser and chose to refer to it as "sodding fertiliser". Can you give us the context for the phrase? 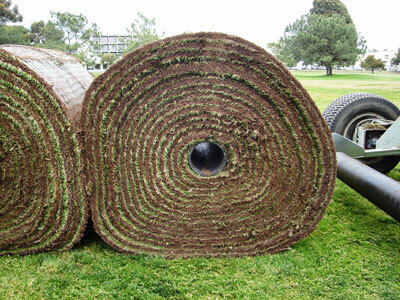 In the US, sod refers to large rolls or strips of grass used to quickly grow a lawn. (It's faster to roll out sod than to plant grass seed and wait for it to grow.) If you install sod, it requires special fertilizer and lots of water at first to get it to properly "set" and start growing. Would the fertiliser for that not just be called "sod fertiliser" as opposed to "sodding fertiliser"? Hmm, I commonly know "sod fertilizer" as turf fertilizer. You are correct in assuming that "sodding fertilizer" is not the correct noun form. In actuality, sodding is the intransitive verb that indicates the process of displacing fertilizer. Sod fertilizer simply refers to fertilizer used for grass. True, "sodding fertilizer" is not the common phraseology. So either the person quoted was a non-native speaker, or someone not well-versed in the language of landscaping, or was referring to something completely different. How's that for a definitively vague answer? As emsr2d2 wrote earlier, sodding is a mild expletive in BE. Don't seed it - sod it! I guess "sodding" is an expletive then. Thank you very much! Aaaaahhh!! In that case, it's definitely been used as an expletive!